This coming October, the impossible2Possible (i2P) Youth Ambassador team is going back to the incredible continent of Africa! On this next adventure, 8 Youth Ambassadors (aged 17-21) will join Ray Zahab and fellow i2P adventurers, teachers and doctors on the journey of their lives as they run across some of the most beautiful regions in the Republic of Botswana - a country of 2 million people that is located just north of South Africa. Most of the country is covered by the Kalahari Desert, which is currently thirsting and starved by drought. The educational topic for this project will be water, where students from around the world will have their eyes opened to our most precious resource. This 8-day running expedition will cover up to 400 kilometers through the Kalahari region of Botswana. This diverse and contrasting landscape will ensure that this i2P Youth Expedition will be the toughest to date, and will require incredible preparation to guarantee a successful expedition. In their quest to experience this incredible country and communicate their adventure with youth all over the world, the 8 Youth Ambassadors will first be divided into two teams of 4. For the first 4 days, one team will be responsible for running support & educational work, while the other team will be running an ultramarathon per day, for roughly 200km. Halfway through the expedition, the two teams will then switch responsibilities. The i2P Youth Ambassadors will relay information back to thousands of students in classrooms around the world as they study water, share the experience of running ultra marathons day after day, and learn what it takes to execute an international expedition. As globalization and international collaboration increase, there are greater difficulties in cross-cultural communication. Challenges consist of understanding local issues from various perspectives or working with people who have different communication styles. Intercultural communication can help you approach the world with various regional perspectives and give you the tools to build bridges across cultures. As part of their preparation for Expedition Africa2012, the i2P Youth Ambassadors have undergone cultural sensitivity training to help them gain a better understanding of the social and environmental issues surrounding Botswana. These newly developed intercultural skills will enhance their ability to work in teams, become community leaders, and empower others to take action. In honor of the International Decade of Biodiversity, team i2P will investigate the important issue of Water and its Effect on Human Development and Biodiversity. This year i2P has partnered with Simon Fraser University to offer an enhanced educational curriculum to classrooms that wish to learn about water issues along with our Youth Ambassadors. Our education team will be available in the weeks leading up to, and during, the expedition to guide students and teachers through topical questions, class exercises, and videos on water. There will also be opportunity for live videoconferencing with the Youth Ambassadors getting a first hand look at the water issues in Botswana. impossible2Possible is once again reaching out to Educate, Inspire, and Empower an entire generation! 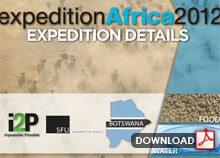 The impossible2Possible Water & Biodiversity Program will be the focus of Expedition Africa2012. An advanced education resource program will span the preparation and execution of this expedition, with students witnessing what it takes to prepare physically and mentally to push beyond perceived limits. impossible2Possible is honored to have so many incredible schools participating in Expedition Africa2012! Thousands of students will join Team i2P as we prepare and then run in the Kalahari Desert in Africa. Check back often to see your school added here! The World Expedition Series is designed to transport students to remote and contrasting locales around the world. To date, the Series has seen young adventurers trek among glaciers containing millions of liters of water in the Canadian Arctic, across the desolate sands of the Sahara, through the dense and lush jungle of the Amazon, traversing portions of the Bolivian salt flats into the mountainous Altiplano, and venturing through the vast & expansive Thar Desert. As with all i2P Youth Expeditions, the team will push themselves beyond any perceived physical and mental boundaries they have ever placed upon themselves to discover that they are truly capable of achieving the impossible. Transamerica, the Transamerica Pyramid, Transform Tomorrow and Tomorrow Makers are registered service marks of Transamerica Corporation.